Hi Jayme and Groundspeak development team! Thanks for this survey and the chance to be part of the development process. I'm sure many users really appreciate this. To come to your questions, I will answer them in the order you asked. In my opinion it should be a place for personal information and a short (!) introduction of yourself: who you are, what you like. Nothing is more annoying than huge external statistic profiles who need a hell of a time to load when you open a friend's profile. No, I do not display banners anymore. For a certain time I used to. But it was six or eight banners that were important for me, not the load of banners some users have today. Usually I look at other's (especially my friends') recently found geocaches, and if some of them are interesting for one of my future tours as well. And I like to watch people's picture gallery. I wish I had a direct link to my friends' founds from the “Your Friends”-overview without clicking the exhausting way: “Profile” - “Geocaches” - “All geocache finds”. Three clicks where only one was necessary. For the list side I would like to have the Bookmark Lists before the Favorites. Everything else is okay for me. I don't care for statistics. I wouldn't need that entire tab at all. After the survey I take the opportunity to say thank you for the new Advanced Search preview. I think that is a nice step in development. Especially that you implemented the favorite points as a search criterion is wonderful. 1. What do you use the bio box for? At the moment I have a flag counter and Project GC stats in it. To be honest I didn't think about writing anything about me in it, but with this thread prompting me to look at what others have written in this box, I really like the more personalised bio. However I do like the Project GC stats, and an ideal solution for me would to be able to put these on the stats tab. 2. Do you display banners from caches or events on your profile? How important is it to you that you are able to display these on your profile? No, and I don't think I would ever want to do this. I'm also not really interested in looking at the banners others have on their page either. 3. What do you most enjoy looking at on others' profiles? I suppose this is answered by why I would click to look at their profile in the first place. If I'm travelling to a new place and I notice someone's log on a cache I'm looking at in the area I might then look at the other caches the person found in that area to see what was active. I also will look at a COs profile if I want to contact them about the cache, or to see how active they are if there's been no response to email/NM logs. I will also look if someone has visited a cache where I dropped a trackable but hasn't logged it. I don't look through galleries, or souvenirs. I do like a look through the stats if they have GSAK or Project GC ones. Trackables logged count - this is in the trackballs tab, so not sure it's relevant here for me. ~ Link to give gift membership - I can't see why anyone would want to do this? Last visit to website - useful if I'm looking to contact a CO, although if it doesn't include visits via the App then not really a reflection on actual usage. See forum posts - I've never used this. Geocaches: all useful, maybe include DNF's too? Trackables: useful when I'm trying to track what has happened to a trackable, otherwise I never look at it. Souvenirs: I'm not inclined to look at other people's (the August ones really clutter up the page! ), but I quite like the country ones personally (just wish there were more available!). Lists: - I never really looked at this tab until this thread! I see now those caches that I've awarded a favourite point come up, but I haven't created any other lists. I'm not in a very cacher-rich area, so I could see how this would be useful on others profiles for cache ideas, but I've almost exhausted the 25 or so caches within an hours drive of my house, so at the moment I don't use it, but I might if I were to move back to the UK for example. Statistics: - I like this tab (I'm an auditor ). It would be great if you could add third party stats here instead of putting it in your bio. Thanks for giving us the opportunity to comment on the profile. When I posted my bit about the Profile earlier, I said that as well as the "Caches Found" and "Trackables Logged" numbers, it would be great if it also showed people's "Caches Hidden/Owned" number. I'd like to add to that, I also think it would be good to show people's "DNF" number. Logging DNF is nothing to be afraid of, and can really help the cache owner and later searchers. I've added that stuff to my own profile using some HTML (click on my name to see what I mean), it looks great on a computer but it messes up on other devices like mobiles. It would be really great if it was just a standard feature. Quite a few people would like to be able to see their number of DNFs and number of cache hides on the first page of their profile. See this thread. 1. the total number of DNF logs you've created. 2. the total number of CACHE you've DNF'd, you may have DNF'd some caches more than once so this could be less than the figure for 1. 3. the number of caches which are still DNF, i.e. ones which you DNFd but subesequently found are not counted. I'm not sure which would make more sense to me, perhaps 2 or 3. Add me to the list and put me down for #1, please. #2 is possible but the number of logs is more reflective of one's caching history. #3 is too complex. 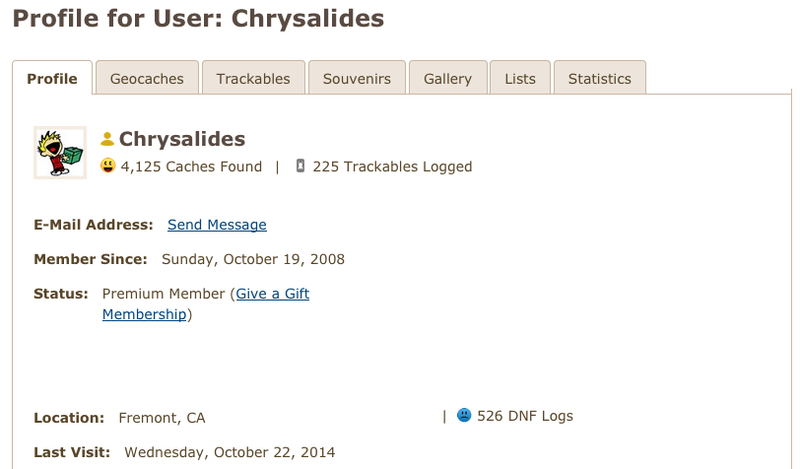 Would you include caches you never found but are now archived? Or just active unfound? #1 is just great for me too. Let's not over-complicate things for no reason. Map with circles for Traditional, Misery and Multi caches where I have found all caches of that type arround my house. Number of chaches per calendar day. Please don't break the possibility to make this kind of things. I look on others' profiles to get an impression of how long they have been caching, what kind of caches they do and where they are caching. The things I enjoy is if they made something beautiful of it. 4. Below you will find all the functionality that the page currently offers. Place the items in a stack ranked list of priority. Things that are most important to you should be at the top. Let us know if there is anything missing from the list. What information isn’t necessary on the page? What is taking up screen space that shouldn’t be? What do you not find useful? The lease useful are the two white bars left and right of the content taking up screen space. Please restore the floating design you had a couple of years ago. Don't remove this. Perhaps add a link to all Trackables regardless of the kind. Don't remove this, a method to browse though all the images would be nice. Also nice: An overview of all the images at all my caches / trackables. 1. The Bio Box is where I store my Geocaching statistics, generated in GSAK. Not only are the official Groundspeak statistics not as detailed/customizable as what I can do in GSAK, I have found some unique moving caches (GC43F3 as an example) and they tend to mess up the Groundspeak stats so I handle them differently. 2. I do not display banners from caches or events on my profile. Not really important to me. 3. I like seeing how long they have been caching, whether or not they appear to be active (logging into the site, finding/hiding caches), and viewing their gallery of images. I like seeing people who have found a cache I am interested in and seeing what other caches they did on that day as I'll sometimes use that for route guidance. If DNF counts are added, I would delete all of my DNFs. Nobody's business what a terrible geocacher I am. My failures are my business. I took a look at your profile page...well, actually I tried to look, but after 2 minutes I gave up waiting for the massive amount of banners to load. No wonder the GS servers are so overloaded. I thought the example shown earlier, explaining what these banner things are was busy. Yes, an editable page for stats/banners would be nice, if people would use it to move the bloat off their main profile page. Yeah, 500+ images seems a little excessive for the main profile page. It might be okay for a separate user-editable stats/banner page, where the visitor has (presumably) specifically requested to see it. But for the main profile page, it's a bit much. No, I don't. What do you mean? Clicking image opens bigger view that links to log page/edit: would be nice to read the log right below the popped-up image - I see an interesting image and want to know the story. note for others: guys, this thread is not a chat. I can't say I understand this approach, even though I respect your right to follow it. To me, my DNF's are part of my caching experience as well as the cache's history. I have nearly 90 DNF logs for nearly 700 cache finds which means a higher than 10% failure rate. What this difference in approach strongly emphasises is that a lot of things in the public profile should be optional. Some folk want a Find count, some don't. Some want DNF count, some don't. Statistics, Souvenirs, favourites all have people for and against. One thing the development team might want to consider is what information is essential (must be displayed) and how to make everything else optional. I like seeing how many finds a person has, I think this number should be bigger and bold. It is the most important statistic about a person. Some people say that it's not about the numbers, but don't deceive yourself, it really is. Your find count is how you judge people, and their experience as a cacher. While I don't display graphics about events on my profile, I do display many other graphics on my profile that are mostly related to accomplishments I have made regarding geocaching, but also clubs that I am a member of, and also dynamically updating graphic/text combos from this and other sites. I very much value the ability to load and use my own graphics and "bling" from my own web storage offsite. Mostly their find count, and their last visit. Their find count allows me to quickly judge how experienced of a geocacher they are, and whether I can put any faith in their DNF logs, and their Last Visit, so that I can carefully choose my words when logging a Needs Archived log, or determine if that person is even interested in Geocaching anymore. This is also very valuable information that I would be very disappointed to see leave. To me, a person's avatar is a quick indicator of their personality and what they find important. This should be bigger and bold, because it is the most important statistic about a person. To those that say it's not really about the numbers, don't deceive yourself, it really is. This number is irrelevant to me. I like this feature, and find it very useful. This is also valuable information about a person and how experienced they are. Kinda valuable. I like to see it. If a person is a Premium Member, then I know they are kinda serious about Geocaching. If I were a charter member, that is something that I would be proud of. It is useful to know if somebody is a moderator, reviewer, or lackey. I would not like to see this go. I feel this is just an advertisement to try and people to try and get people's money, and I would like to see this go. I like to see where a person is based out of. I wish this information were compulsory. Another very valuable statistic, see my opinion on this above. Alright I guess. I think the whole concept of "friends" on this site is kind of silly, but it's nice to have certain people conveniently grouped into one central area. This can stay. This is completely irrelevant to me. I don't think I've ever once used this. It can easily go. Occasionally, I look at other people's caches. Not very often. I don't care about trackables at all. I like to look at Souvenirs, but I wish they were much less common than they are. Now because they're so common, it has diluted their original significance. I wish they were sorted somewhat, like states by states, flash mobs by flash mobs, etc. Gallery, I only look at very occasionally. Lists, I only look at very occasionally. Usually when I'm trying for a challenge, and the CO has made a list of potential qualifiers. Statistics, I keep my own and look at them often, I don't look at the ones kept by Groundspeak. I would really like to be able to be able to get a GPX file from the simple summary box generated on the map. Put the link next to Log Visit. Banners. Like to display them,and awards. Others profiles.Good general information point on a cacher history. Send E-mail, ALL accounts must be verified when set up !! Problem at present !! Interesting. Other than newbies with single-digit find counts, I really don't care. In this day of numbers run trails where someone can return from a long weekend with another 2k finds, the find count is pretty meaningless. What matters to me more, and what I'd like to see bigger/bolder if we're going that route, is their last visit to the web site (or their last access via any method), their start date, and their location. Thanks for the feedback everyone! Closing this thread now to compile all your thoughts and share it with the team.